Profiling your audience has never been easier. 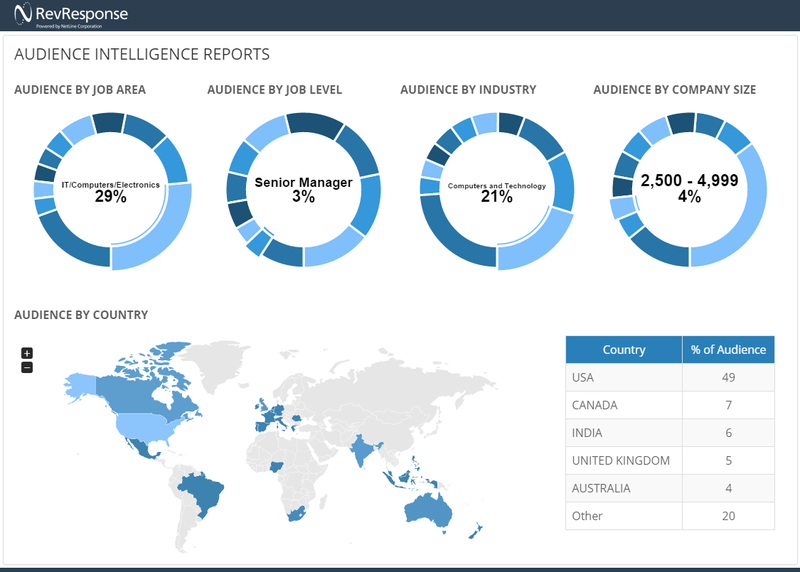 All RevResponse Partners can access Audience Intelligence Reports with their Dashboard. The Audience Intelligence Reports (AIR Reports) chart five key indicators profiling the professional makeup of your audience. This data is compiled as your audience submits requests for the offers you are promoting. Therefore, as soon as your start promoting your Dashboard will begin to report on this data. The reports reflect real-time data showing the past 30 days of activity. The five key indicators in the AIR Reports are charted by percentage of your total request pool. The top ten values of each demo can be seen by hovering over each section of the chart. As you may know, the request form includes an option for “other” which you may see in your charts. Also, “remaining” is used to total all remaining demographics outside of the top ten. The AIR Reports are perfectly formatted for direct inclusion into media kits. Reporting deep levels of audience analytics for prospective advertisers is the best way to attract new business. Learn how to apply your audience analytics data by checking out our post, How to Make More Money with Audience Demographics. Not a Partner Yet? Sign-up Free Today!